Our maitre'd and his attentive waiting staff will welcome you to the elegant Waldorf Restaurant where you can opt for a full English breakfast, savor a leisurely five-course lunch and enjoy a delightful dinner every day of your cruise. As a casual alternative, the light and airy Marco's Restaurant is open every day for buffet style breakfast, lunches and dinner. Here informality is the key and you can feel free to drop in without any ceremony. The Pool Deck lends itself particularly well to al fresco meals so a buffet breakfast or lunch from Marco's can be served up with a complimentary ocean view! 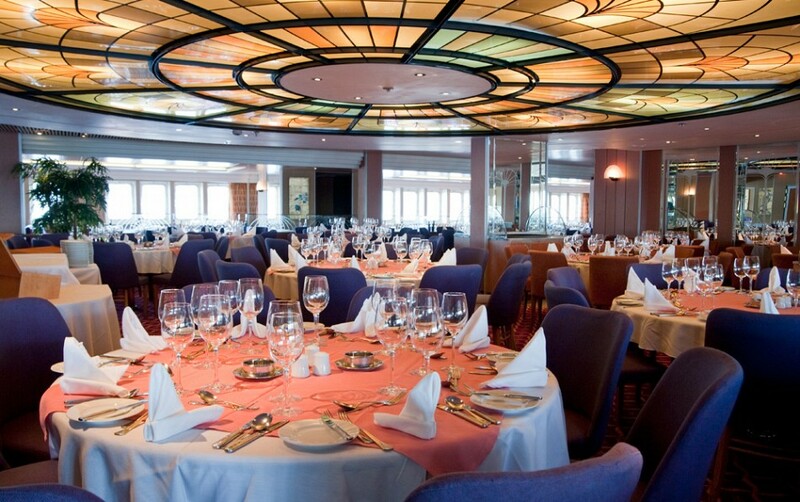 The Marco Polo cruise ship offers a wide range of public facilities including the impressive Waldorf Restaurant offering a traditional two sitting fixed time dining option and, as an alternative more informal experience, the stylish Marco?s Bistro. 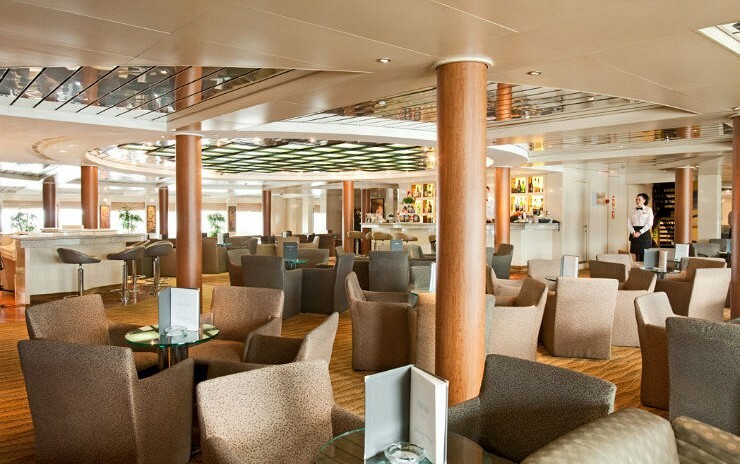 There are five main lounge areas. The Magellan Deck offers the theatre style Marco Polo Lounge; the elegant Captain?s Club, a perfect venue for pre-dinner cocktails with the resident pianist; relaxing Palm Garden, with wonderful panoramic ocean views; and the stylish Columbus Lounge where the head barman will soon get to know your favourite drink. Completing the quintet is Scott?s Bar, located on Amundsen Deck, an ideal spot for night owls. 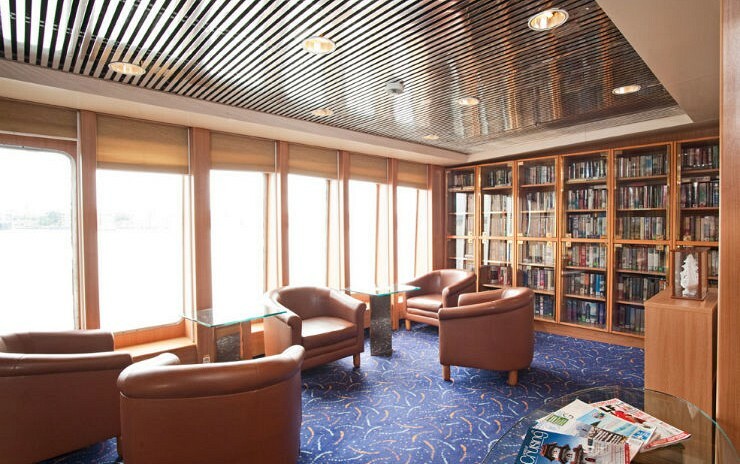 Other amenities on board the ms Marco Polo include the well stocked Livingston Library, the Nansen Card Room, an Internet Caf? a shopping arcade and photo gallery, the beautifully appointed Jade Wellness Centre, which offers hairdressing & beauty treatments, fitness and exercise equipment, and sauna and massage facilities. There is an outdoor swimming pool, three whirlpools and a medical centre. In addition, and in keeping with her heritage, the Amundsen Deck offers a traditional walk around promenade. 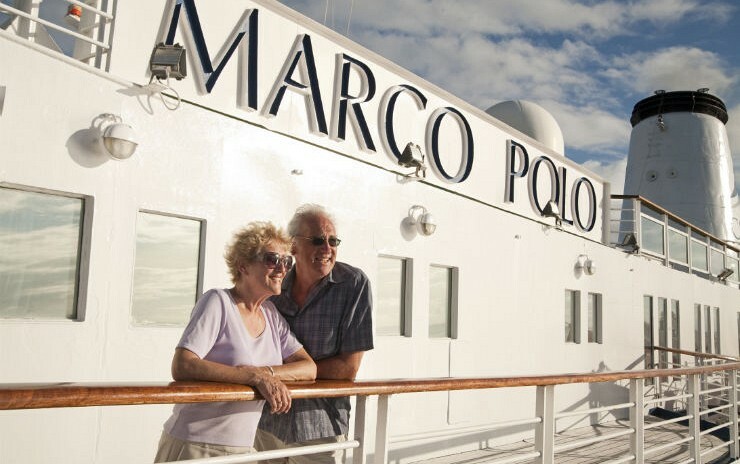 For the enjoyment of our adult passengers Marco Polo operates as a 'child free' ship. This means that even during school holiday times you can enjoy the pleasures of cruising in the company of adult passengers only. We will however accept teenagers who are 16 years old or above at the time of sailing but they must be accompanied by adult passengers. 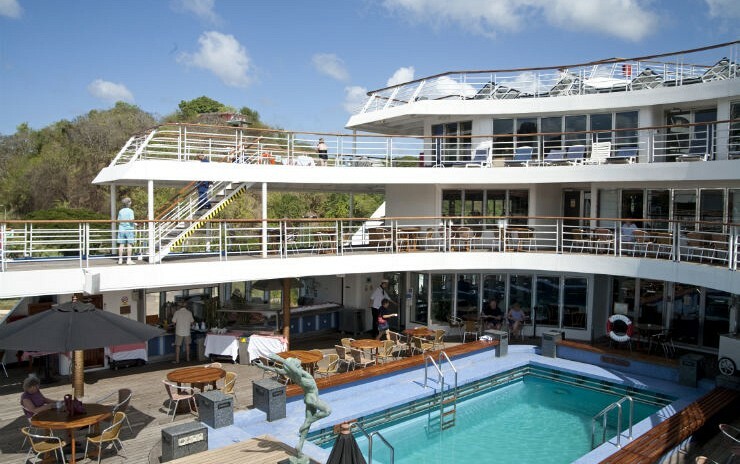 Families will however be welcome to cruise aboard Ocean Countess although it should be noted that there are no dedicated recreation facilities for children. 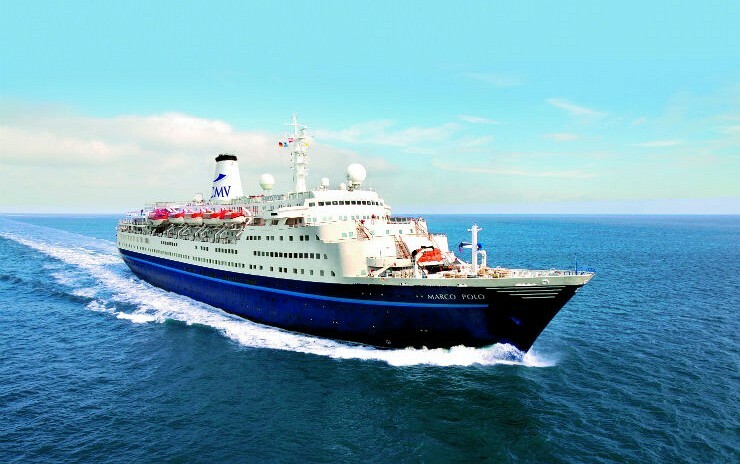 Marco Polo is an extremely comfortable ocean liner with a wide range of public areas and deck spaces in which to relax. 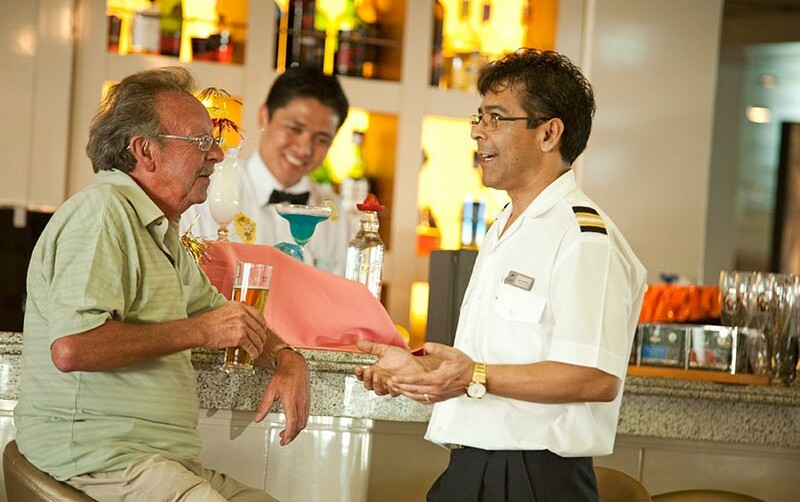 However, it is your cabin that should be the perfect place to unwind after a busy day sightseeing ashore and your unobtrusive cabin steward will ensure that you enjoy a high degree of comfort and service, whichever grade of accommodation you decide best suits your holiday requirements. There are fifteen categories of cabins and suites, primarily graded according to size and deck position and even in the most economical cabins, the standard features are impressive. There is a good selection of comfortable cabin accommodation with 70% of cabins having an ocean view. Cabins range from standard, superior, premium and deluxe and category options priced generally according to position size and the facilities available. Cabin amenities comprise private in-suite facilities including a shower washbasin, toilet, and a hairdryer. All cabins also have a television for satellite channels and in-house movies, telephone, two music channels and a personal safe and the more spacious higher graded deluxe accommodation have the added benefit of sitting areas, large panoramic ocean views, a bath tub and a fridge. 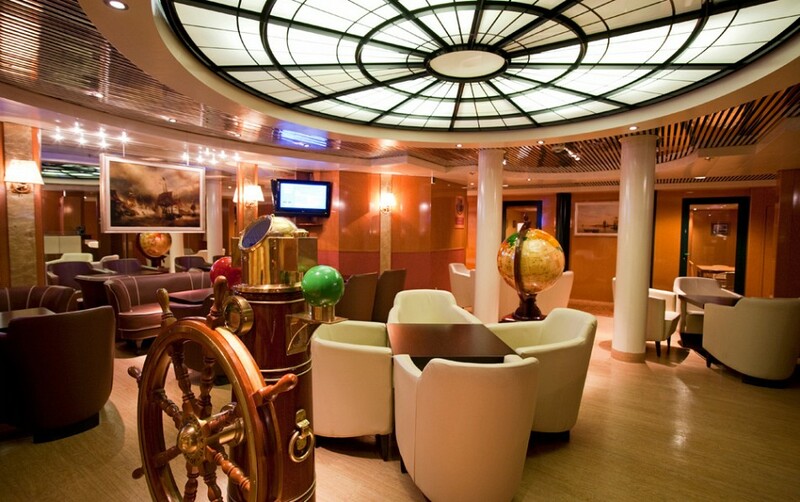 Marco Polo offers the discerning traveler a traditional maritime experience in cozy surroundings. Discover a wide range of comfortable lounges and stylish leisure facilities to enrich your time on board. Her wide range of public facilities include the impressive Waldorf Restaurant offering a traditional two sitting fixed time dining option and, as an alternative more informal experience, the stylish Marco's Restaurant. 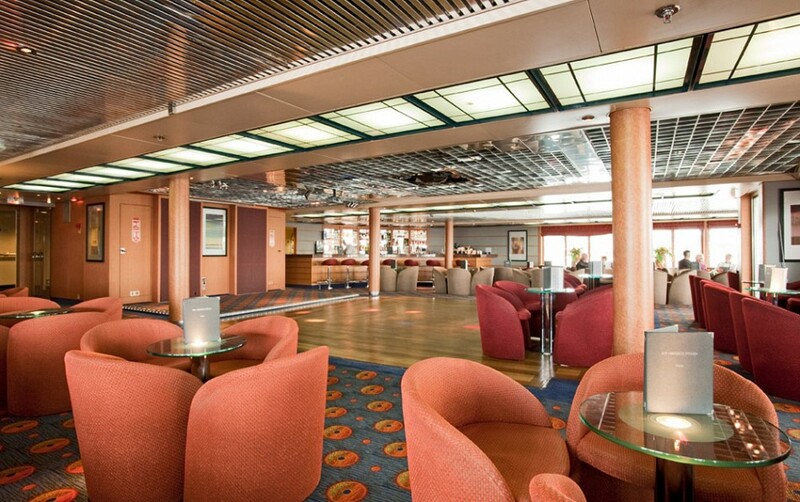 There are five principal lounge areas. The Magellan Deck offers the theater style Marco Polo Lounge; the elegant Captain's Club, a perfect venue for pre-dinner cocktails with the resident pianist; the relaxing Palm Garden, a quiet spot with wonderful panoramic ocean views; and the stylish Columbus Lounge where the head barman will soon get to know your favorite drink. Completing the quintet is Scotts Bar, an ideal spot for night owls, located on Amundsen Deck. Other amenities include the ship's attractive well stocked Livingston Library, the Nansen Card Room, an Internet Cafe, a spacious shopping arcade and photo gallery, the beautifully appointed Jade Wellness Centre, which offers hairdressing & beauty treatments, fitness and exercise equipment, and sauna and massage facilities. There is an outdoor swimming pool, three whirlpools and a medical centre. In addition, and in keeping with her heritage, the Amundsen Deck offers a traditional walk around promenade. 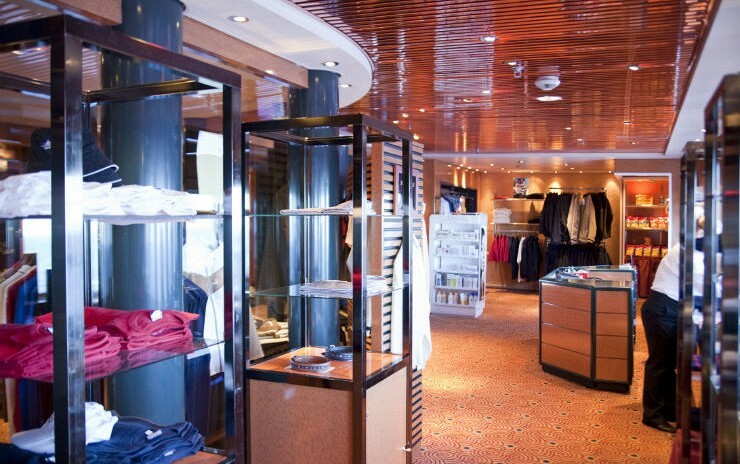 At the very heart of Marco Polo is the stylish Captain's Club, a popular place to meet fellow passengers. To start your evening you might opt for a pre-dinner drink here and enjoy a few of your favourite melodies played by our resident pianist. After dinner the show team would enjoy the pleasure of your company in the comfortable theatre-style Marco Polo Lounge as our artists display their talents in a snappily choreographed revue or colourful floorshow - all you need to do is just sit back and enjoy. 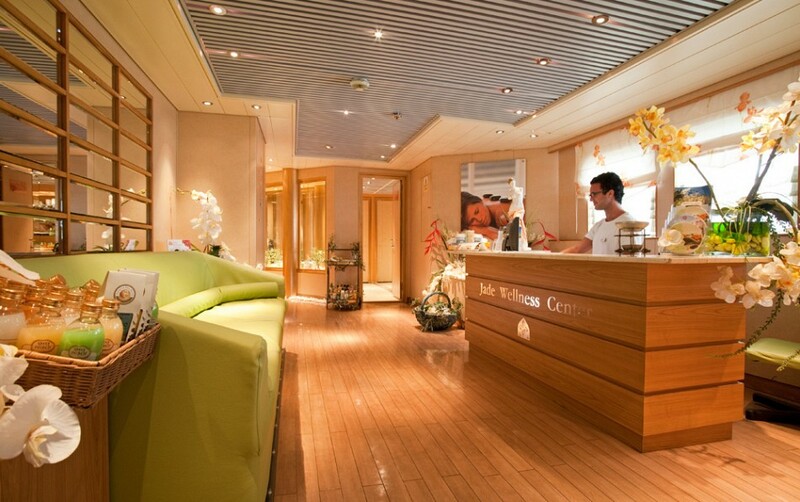 The beautifully appointed Jade Wellness Centre is nature?s secret of well being on the Marco Polo. It offers hairdressing & beauty treatments, fitness and exercise equipment, and sauna and massage facilities. Why not indulge yourself with life?s most perfect gifts: relaxation, invigoration and rejuvenation. Treat yourself to a spa package and design your own special day. With Arts and Crafts growing in popularity, we are including sessions on all CMV cruises of five nights or more. Specialists will be delighted to demonstrate their talents replicating many of the growing number of new crafting skills now witnessed on dedicated TV channels. These may include millinery, bead jewellery, mosaic decoration, calligraphy and decorative card art. You may need to buy materials on board which will be supplied by the crafter for a modest charge. Watch out for our Super Craft cruises where we will be offering a variety of different crafting options and perhaps you will return home with a brand new skill. On selected cruises we are introducing our new light hearted Audience With... where you are invited to listen to an invited guest speaker or performer talk about their life experience and expert knowledge interspersed with questions from you, the audience. This offers you a great chance to become involved and be a part of the fun. Having trialled these with selected eminent guests, our audiences have loved them, we hope you will too. Look out for some celebrity names joining us including Brookside actress Julie Peasgood and Royal Variety Show comic Andy Ford. Following the great success of many guest acts from the field of comedy we are launching Laugh on the Ocean Waves where, on selected cruises, you are invited to enjoy the talents of one of our guest comedians Laughter is the best medicine so enjoy the talents of our comedy acts with their dedicated evening shows, hear them talk about their life experience and listen to their Comedy Corner interviews with the Cruise Director. Learn more about a fascinating subject from someone who is passionate about their interest and will want to share their knowledge and enthusiasm with you. CMV cruises of five nights or more are accompanied by one or more of these experts giving informative talks or practical sessions on a range of fascinating subjects. These speaker subjects may include maritime history, broadcasting, gardens and even criminology! They are generally programmed to take place during days spent at sea rather than in port, so that you will not miss out. A comprehensive list of planned topics is detailed on these pages. If you would like to play bridge, backgammon, chess or another activity, simply have a word with our Librarian. After a brief sign-up session you are then put in touch with other passengers who share the same interests, allowing you to make the most of your time aboard. It is never forced just helpful. Following dinner the show team would enjoy the pleasure of your company in the comfortable Show Lounge as our artists display their talents in a stlish 'big show' - all you need to do is just sit back and enjoy. For a little night music, we have different combos around the ship who will play for your listening and dancing pleasure, everything from strict tempo to disco. Our speciality acts and guest entertainers complement the show team to ensure that your evenings go with a swing. 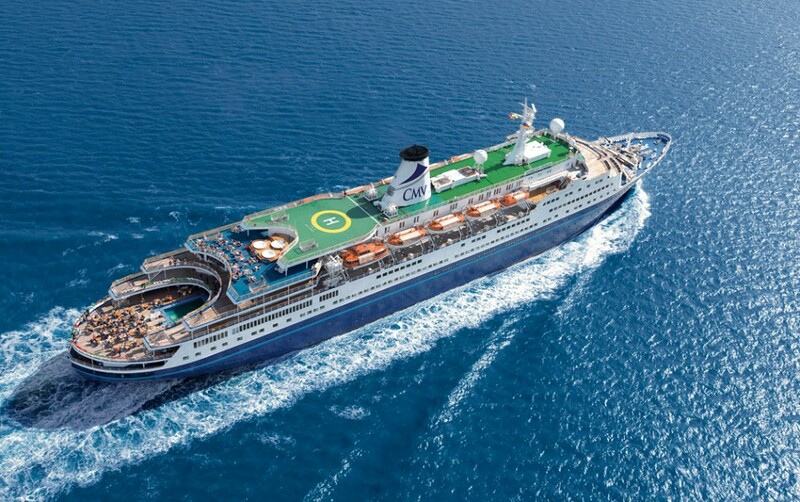 With quality acts such as the Syd Lawrence Orchestra and Andy Ford (Royal Command Performance comedian sensation) among the many top performers, CMV can offer a great cruise experience. If however it is quieter pleasures that you prefer, how about a few hands of cards or making up a table for a syndicate quiz.